One of the strategic goals in the Communication Sciences and Disorders (CSD) Department is to increase alumni involvement. CSD honors a distinguished alum each year at Homecoming, and recently had a number of alumni attend a networking event with our students. In an effort to “think outside the box” and plan something really unique, Associate Professor Heidi Harbers had the great idea to plan a trip. Thus, planning began for the first CSD Alumni Trip in 2016, in conjunction with Education First (EF). EF works with the department to plan study abroad experiences for CSD students each year; EF worked with clinical educator Julie Burns to plan a once-in-a-lifetime experience for our alumni. From July 21–August 1, 2018, 14 people from three states embarked on a trip to Europe. They landed in Barcelona, Spain, on the afternoon of July 22, touring that beautiful city for two days. The group then traveled by luxury motor coach into France and down the French Riviera, with stops at Nice, Eze, and Monaco. After several days touring these lovely cities, the travelers continued on into Italy, visiting the coastal villages of Cinque Terre, Pisa, Florence, and Rome. It was a wonderful way to see the world with like-minded people who all appreciated what they’d learned at Illinois State University. The group was composed of speech-language pathologists from university settings, hospitals, and schools. We reminisced about our old professors and discussed the many ways our profession has evolved over the years. 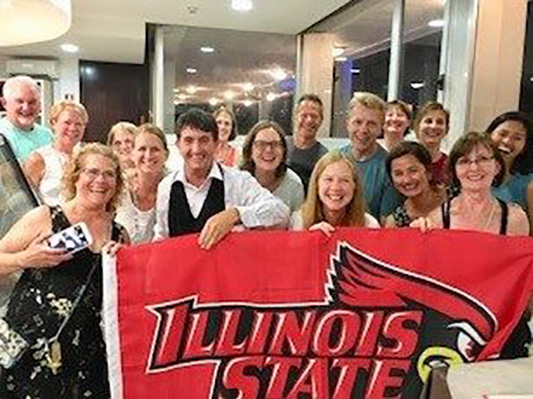 At each stop, we pulled out a big Illinois State University flag with our beloved Reggie Redbird on it and snapped some group pictures, like the one here with a favorite waiter in Italy. Alumni of CSD are encouraged to connect with the department for ongoing activities and events. Contact jtburns@IllinoisState.edu if you would like to learn more about alumni opportunities in CSD.